Though decades apart in age, Chris Ray and Roy Ogle formed a strong bond over a shared love of Southern peas, plant breeding and Clemson. The South Carolina Botanical Garden may be located at the intersection of Perimeter Road and Highway 76, but a visit there will allow you to travel the entire state of South Carolina in less than 300 acres. 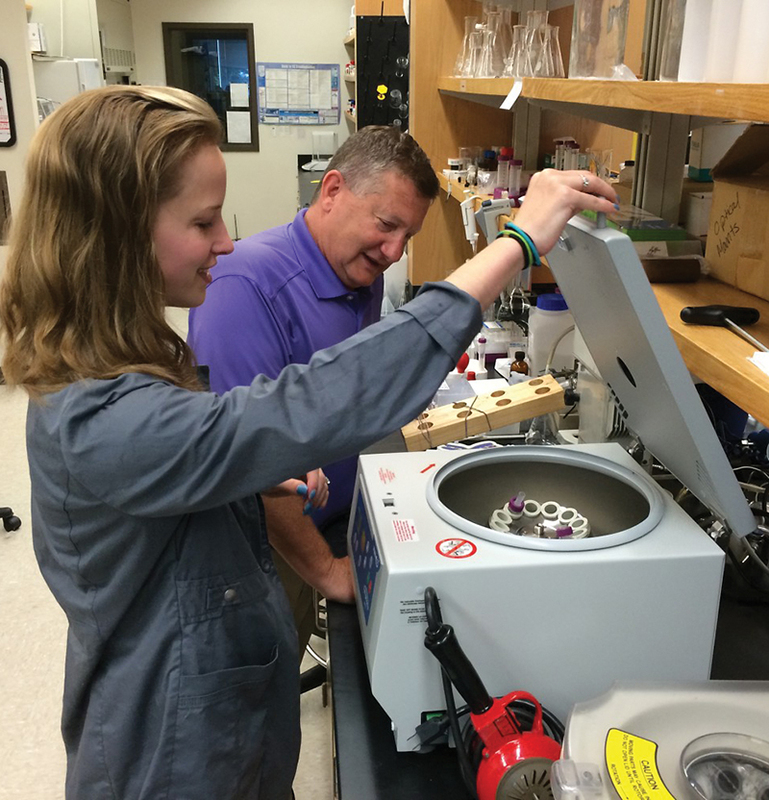 Marissa Pierson, a master’s student, closes the lid on a centrifuge while workinh gin a Clemson lab with Professor Ken Marcus. If you’ve been to the doctor, you probably know what to do when you’re handed a plastic cup and shown to the bathroom. Most patients hand over the sample and give little thought to what happens when it’s shipped to the lab for analysis. Chemistry professor Ken Marcus and his students are the exceptions. They have developed a new testing method that they believe will reduce costs, get faster results and lower the volume of urine needed for a sample. It’s great news for patients who get the willies when the nurse pulls out the needle to draw blood. The method Marcus and his students have developed could help make it possible to use urine instead of blood to test for more diseases such as early-stage coronary heart disease or sleeping sickness. The trouble with testing urine is that it’s awash in salt, Marcus said. It can be tricky to isolate the proteins that act as biomarkers, the clues that tell whether the patient is sick or has ingested a drug. The magic ingredient in the group’s research looks like kite string, but it’s no ordinary twine. It’s made of capillary-channeled polymer fibers. As part of a study, Marcus and his students packed the fibers into plastic tubes and then passed urine samples through the tubes by spinning them in a centrifuge for 30 seconds. Then the researchers ran de-ionized water through the tubes for a minute to wash off salt and other contaminants. Proteins are hydrophobic, so they remained stuck to the fibers. Researchers extracted the proteins by running a solvent through the tubes in the centrifuge for 30 seconds. When it was all done, researchers were left with purified proteins that could be stored in a plastic vial and refrigerated until time for testing. The team was able to extract 12 samples in about five minutes, limited only by centrifuge capacity. In urine tests commonly used now, polymer beads extract the proteins. “The difference is that ours is smaller, faster and cheaper,” Marcus said. The team’s work was recently published by the journal Proteomics — Clinical Applications. The research has been about a decade in the making with various students working on it over the years. Marcus said that he has graduated 33 Ph.D. students with more than half going on to work for national labs. Others work in industry and for the Centers for Disease Control and Prevention. Still others in his lab are focused on the development of analytical methods for post-detonation nuclear forensics. For Marcus, the most important thing is to create a research environment that produces well-prepared graduates. “My pride is putting those people out and seeing them get really good jobs,” Marcus said. 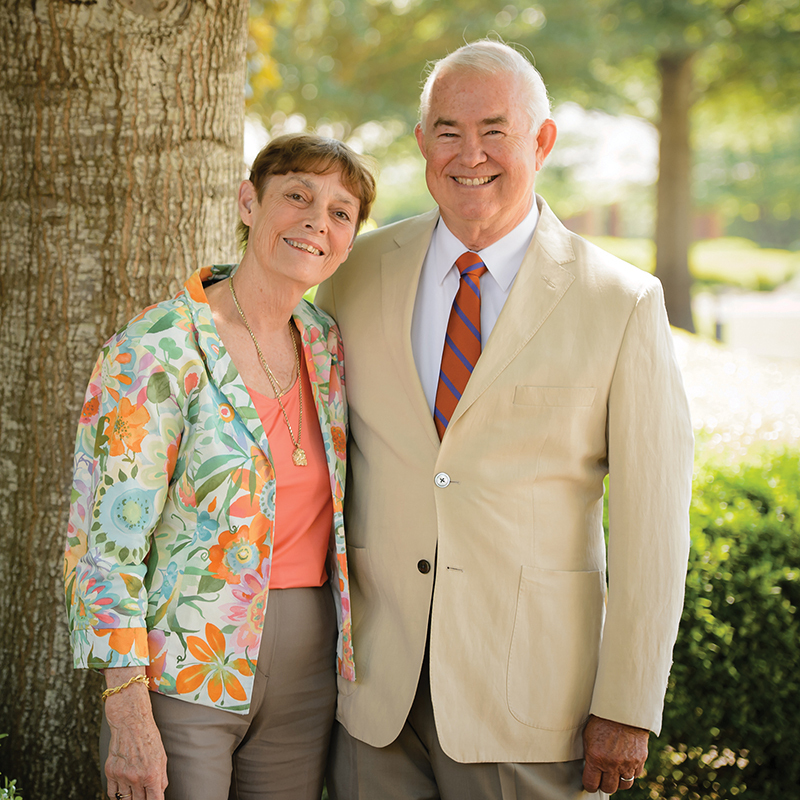 Each year, more than 4,000 Clemson undergraduate students enjoy exercising their imaginations through a unique, faculty-led research program because of Phil and Mary Bradley’s generosity. Phil’s father, William F. Bradley, was a veteran student at Clemson College in the late 1930s and finished his degree in 1952 after a long leave of absence. Throughout his childhood, Phil had his heart set on Clemson and much to his satisfaction, enrolled here after high school. After his sophomore year, Phil married his high school sweetheart, Mary, and before he graduated in 1965, they had begun their own family with daughter, Renee. Clemson’s hills are full of memories for the Charleston natives, and today they enjoy giving back to the place that gave so much to them. It began in 2005 when Phil and Mary met with former provost Dori Helms to learn more about her vision for a new undergraduate research program called Creative Inquiry. The Bradleys also were introduced to a few of Helms’ students and took note of what they were accomplishing in their studies. To say they were impressed would be an understatement. “Some students were starting businesses and even had patents and copyrights. It was a real eye-opener for me,” Phil said. The Bradleys stepped up and assisted with funding the program through annual support for five years. “I really wanted to help a program that needed financial support, and there’s been unbelievable growth,” he said. The program’s growth as well as the Bradley’s continued appreciation for the students led them to provide the first major gift for the Creative Inquiry Enhancement Fund. However, it wasn’t just the students who made an impact on the Bradleys. They also took note of how passionate the faculty members were about the students’ success and felt these mentors deserved recognition. This inspired the Bradleys to establish the Phil and Mary Bradley Award for Mentoring in Creative Inquiry — a generous award presented to a faculty member in recognition of outstanding work with undergraduate students. Clemson traditions were engrained in the Bradley’s children, Philip and Renee, at a very young age. They are now proud alumni and have passed on their love for Clemson to their very own families. 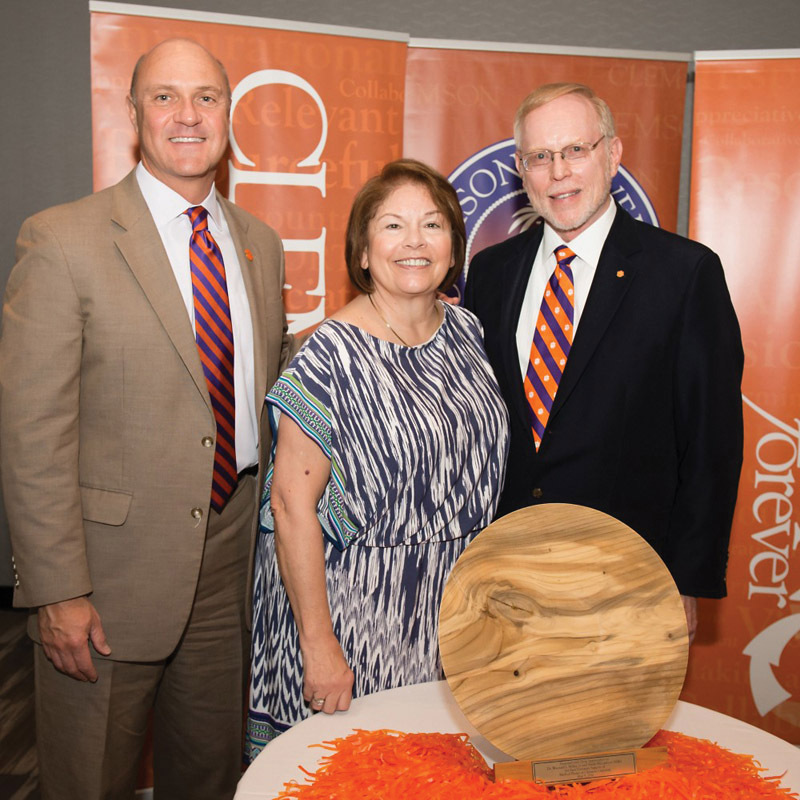 The family’s shared love for Clemson encouraged Phil and Mary to become more involved on campus. Phil was elected to the Board of Visitors in 2006 and is also a proud member of the Clemson Foundation. “This gave me the opportunity to see the needs of Clemson University and how we go about meeting those needs. It’s gotten me more involved in not just the support of athletics but what’s happening on campus and how we can further those goals,” he said. The Bradleys are a “One Clemson” family, supporting both athletics and academics, and believe that seeing the outcomes has made a big difference in their lives. Phil and Mary often talk to one another about their relationship with Clemson and always agree that it is money well spent. “There is nothing like the satisfaction of knowing that you have made a difference in the life of a Clemson student,” Phil said.